Ideal for daily cleaning of wheels! It is a wheel cleaner convenient and economical. Anyone can use the wheel cleaner as we have specially formulated a product is actually use for professional car detailing. Therefore, you can clean as much as possible without causing damage to the wheel surface. Environment friendly. Now adays decoration on wheels tends toward an open rather than closed rim design. This exposes the wheel rims to brake dust, which is a more significant factor in rim maintenance than might initially appear. Brake dust includes metal fibers from the brake pads that can scratch the rims if not removed with care. Wheel and Tire Clean is ideal for daily cleaning of wheels. The product is specially formulated to perform the quality cleaning capability with minimized damages to wheel surfaces as much as possible so that anyone can use the product casually and comfortably. Also washing wheels with Wheel and Tire Clean is quite easy, apply the liquid to wheel surfaces and clean up with a sponge or brush lightly. You can easily clean and remove dirt made by daily driving. Efforts like rubbing hard are not required anymore. Dirt on wheels, which are totally different from dirt on car body such as paint surfaces, are very tough and adherent. 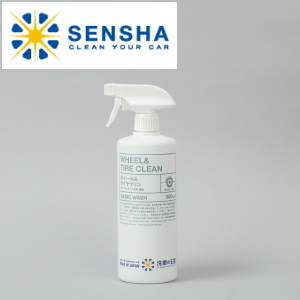 Therefore, car shampoos for car body could not clean wheel dirt adequately. Wheel and Tire Clean contains the penetrable alkaline ingredients in addition to ingredients required for cleaning wheels hence dirt is peeled off and removed. You will be understood what is the quality cleaning once you use Wheel and Tire Clean. You may not remove brake dust stuck for a long period of time by Wheel and Tire Clean. We recommend Brake Dust Cut for this. There is a possibility of staining or dulling especially when working on plated or polished wheels. First check at an inconspicuous areas that no problems such as staining occur.